Editor’s Note: This article was written by two Blanchester High School students and was provided to the News Journal by the school administration. JUULs and other electronic cigarettes (e-cigs) are popular among teens and young adults. But a tobacco expert recently warned Blanchester middle and high school students that there is potential harm in the as-yet unknown long-term effects of these products. 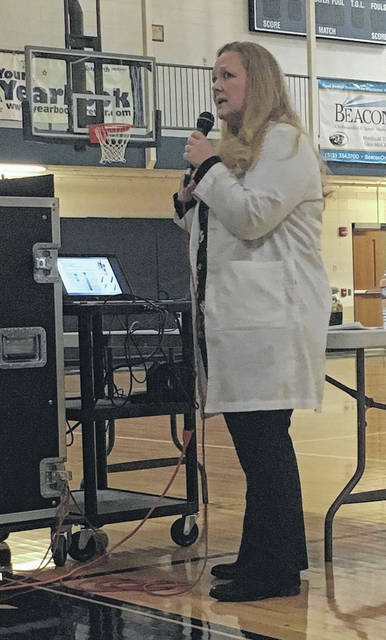 In presenting “JUULs and E-Cigarettes: What You Don’t Know May Hurt You,” Sarah A. Reisinger, a tobacco researcher at The Ohio State University Comprehensive Cancer Center, told students that nicotine — a component of these products — is harmful to the brains of adolescents, who are often targeted by the tobacco and vaping industries. JUULs and e-cigs are a problem among students at Blanchester and across Ohio. In September, Blanchester High School Principal Chris Smith and Assistant Principal Pandy McCarty spoke with students at a school gathering and shared first-hand accounts of the effects of tobacco and nicotine, urging students to stop. When Smith and McCarty recognized that students did not take the presentation seriously, they turned to experts at Ohio State and were directed to Reisinger, who came to speak with Blanchester students in December. E-cigarettes have grown in popularity since the early 2000s, Reisinger said, noting that their sleek and deceptive design makes it easier for students to conceal these devices and disguise them as USBs. E-cigarettes are battery-operated devices that heat the chemicals into an aerosol that is inhaled. Until recently, Reisinger said, e-cigarettes have not been regulated at the federal level, and there have been no requirements for ingredient testing or disclosure. “Though they are advertised to help smokers quit and are thought to consist of less harmful chemicals than cigarettes, the long-term effects are still unknown,” she added. The students learned that there may be many dangers relating to these devices, beginning with the inhaled aerosol, which many students think is harmless. Reisinger showed a video that referenced a study by scientists at the University of California, San Francisco. The study showed teenagers who use e-cigs had higher levels of dangerous chemicals — specifically naming five — in their bodies than those who do not. Along with these threats, e-cigarettes and JUULs may cause inflammation in the lungs. Reisinger shared preliminary data from an ongoing study at Ohio State that shows a potential increase in inflammation in the lungs of e-cig users when compared with non-smokers. However, she noted that the study continues and that it is too early to make firm conclusions. If these concerns are not convincing enough, Reisinger said, there is another dangerous factor involved: Both e-cigarettes and JUUL products contain highly addictive nicotine, which can train the brain to be addicted to other drugs, especially within the developing brain of teens. “And if the liquid within a JUUL pod or e-cig is ingested in any other way than through inhalation, such as absorbed through the skin, it can be toxic and in some cases can cause death,” Reisinger said. She said a central problem with vaping is that the tobacco industry’s advertising campaigns target youth, and many of the flavors of JUULs, such as créme brulee and mango, appeal to youth. Reisinger cited data from the Ohio Department of Health’s Ohio Youth Tobacco Survey which shows that, in Ohio, over 20 percent of high school students are current JUUL or other e-cig users. She also referenced studies from the U.S. Surgeon General’s website showing that teen e-cig users are more likely to start smoking within six months compared to non-users. She noted that more recent studies indicate these rates may be increasing. Reisinger told students the federal government has long realized that youth are a target for the tobacco industry but recently acted through regulation to thwart e-cig use among youth. Six states — California, New Jersey, Oregon, Hawaii, Maine and Massachusetts — have raised the legal tobacco age to 21, and other localities within states are following suit. She pointed out that, despite the tobacco industry’s continued success of targeting youth in America, there are organizations fighting nicotine addiction and tobacco use for all ages. For example, the American Lung Association provides facts and links to get help, and the Truth Initiative goal is to inspire a tobacco-free life. The U.S. Food and Drug Administration, the Centers for Disease Control and Prevention, the Substance Abuse and Mental Services Administration and the National Institute on Drug Abuse all offer resources to help cope with addiction. And individuals can call 1-800-QUIT-NOW or go to smokefree.gov to find resources suited to them. With ample help and support available, Reisinger wants students to know they are not alone in the fight against tobacco use and nicotine addiction.